Urban Leaves India: An Update on our activities - Vipul Sanghvi's "Kasturi Vatika"
An Update on our activities - Vipul Sanghvi's "Kasturi Vatika"
The National Seminar gave us an opportunity to learn interact and grow! For last two years we have been making Amrut Mitti.....And so have our volunteers in their own terrace and balcony sills. This year our focus is mainly on making our community gardens flourish and our fresh ventures on terrace gardens productive. We bring you some precious moments of collective effort which is the hallmark of Urban Leaves Team. For those who have not read about Vipuls terrace earlier... click on the link below and then follow the thread. Vipul has been one of the most regular Volunteers at the Urban Leaves- Maharashtra Nature Park Community Farm. He observed, worked hard, took initiative and gave us lots of support in our activities. He simultaneously worked on his own terrace garden. Well you have already read the beginning of his venture ( link above) With loads of Amrut Mitti made, it was now time to design and create Vipul's farm! So what better opportunity could we ask for to practice what we had learnt on permaculture techniques recently learnt from Clea at the National Seminar! Put their thinking caps on! really engrossed in the exercise! paper what we had imagined in our heads! Then began the task of laying out the beds as per the design. Measured the width of beds- to be easily reached from all sides. Filled up beds with Amrut Mitti! Planted a few saplings in drums and beds. Whoa! After a month photos of the same garden! Have focused on bio diversity! Increasing edges and curves! A coconut in the corner! Watch it after two years or so! I am sure you will all wish to have your own, "KASTURI GARDEN" one day! Rather than having rows of beds or number of containers with mono crops, our focus while designing was on bio diversity and multi cropping, using every inch of space, planting in three tiers ( the tall trees, followed by shrubs and ground cover crops) ! 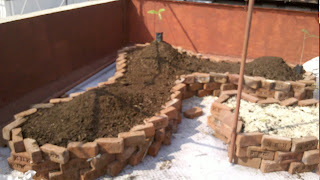 Designing a sustainable food forest on a terrace :D in a mega city Mumbai! Keep a tab... and watch out for more stories! The next garden we focus on is of Purvita Kapadia, who has been tirelessly working on her own terrace and in our Community Farm at Nana Nani Pak, Chowpatty!